Struggling to conceive is stressful. There is just no way around that one truth. Even if everything else in your life is going perfectly according to plan, an inability to conceive can wreak havoc on your mental well-being. So picture this: It’s been a long week at work, made even longer by yet another disappointing pregnancy test. You turn the lights down low in your bathroom, put on your favorite relaxation music mix, and start up a hot bath. In it, you put a few drops of lavender essential oil, while simultaneously setting up the diffuser with an oil blend recommended by your naturopath. You crawl into the tub and close your eyes – allowing the stress of your week to wash away. Sounds perfect, right? Heavenly in and of itself. 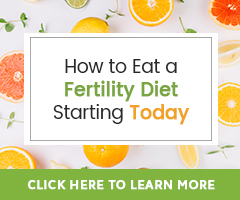 But what if I told you those oils you used, could also be helping to improve your chances of conception by the time your next cycle rolls around? The use of essential oils to cure any number of ailments goes back centuries and spans regions. It wasn’t until the 1930s that they began regaining popularity in modern times, however, with aromatherapy practices becoming more widely accepted ever since. Essential oils can either be dispensed into the air and breathed into your lungs or applied directly to your skin. * Determining which method is right for you depends on the oils being used and personal preference. If you choose to breathe your essential oils in, diffusers can be purchased to make this a possibility. There are also room sprays and steam options available. And for skin absorption, there has never been a better excuse to get a good massage! Some oils prove more beneficial when applied to specific areas of the body, but all can be absorbed through the skin and taken into your blood stream from there. Applying essential oils as part of a massage oil blend prior to Self Fertility Massage is a great way to enhance the benefits of the massage. Geranium (Pelagonium gravolens): This oil is fantastic for balancing hormones and regulating your cycle. It also has the soothing effect of calming emotions and helping you to relieve stress. For women with endometriosis, Geranium may be especially beneficial. Calendula (Calendula officinalis): Great for topical application blended with a carrier oil such as almond oil, Calendula is an anti-inflammatory oil that may help to regulate your menstrual cycle. This is also a fantastic sensitive-skin oil, making it beneficial for use as baby oil (added to a carrier oil first, of course!) once your little one is finally in your arms. German Chamomile (Matricaria recutita): With anti-inflammatory properties, this oil may help reduce pain caused by cysts or fibroids, while also improving your chances of conception. Dr. Joseph Mercola suggests a 5-minute sitz bath with 2 drops each German Chamomile and Lavender essential oils to help relieve menstrual cramps. Yarrow (Achillea millefolium): A detoxifying oil, Yarrow helps to relieve pelvic congestion and prevent inflammation. It is also beneficial for the digestive and urinary tracts. Clary Sage (Salvia sclarea): Influencing your estrogen levels, Clary Sage helps your body to regulate its hormones naturally. It also has the added effect of being a libido booster, which can be important when failed conception efforts have started to affect enjoyment in the bedroom. This oil may also help with male infertility, treating hormone imbalances and impotence. Ginger (Zingiber officinale): This oil has antispasmodic, anti-inflammatory, and antioxidant benefits. It also aids in the digestive system and supports healthy circulation. Rose Otto (Rosa x damascena): An oil that helps relax the uterus and regulate your menstrual cycle, Rose Otto also has a libido enhancing effect and improves cervical mucus. However, it is important to note that this oil should not be used after ovulation in your cycle, as it is not safe during pregnancy. A comprehensive review of clinical evidence by researchers in Iran in Avicenna Journal of Phytomedicine has found that Rose oil provides physiological and psychological relaxation, plus analgesic and anti-anxiety effects. Sweet Fennel (Foeniculum vulgare): A great herb for getting your hormonal system back on track, sweet fennel is best used during the first part of your cycle to regulate menstruation and improve hormonal functioning. This is another oil that is not safe to use during pregnancy. Damiana (Turnera Ddiffusa): This sweet-smelling oil has aphrodisiac qualities and is beneficial for regulating your menstrual cycle by supporting endocrine system function. Not all essential oils are created equal, and paying attention to the quality of the product you are using is important. Make sure to do your research on the company you choose to purchase oils through, ensuring they have a commitment to providing you with the best quality product. Most natural health care practitioners have brands they love and can likely recommend. *Important note of caution: Essential oils should always be diluted in a carrier oil prior to applying to the skin. Only some essential oils are safe to apply to the skin directly (neat) and should only be done so under the advice of a qualified aromatherapist. Farrer-Halls., (2005). The Aromatherapy Bible – The Definitive Guide to Using Essential Oils. Sterling Publishing Co.: New York, NY. There are so many great essentials oils! My best advice is to re-familiarize yourself with those outlined in this guide. Then search the phrase “essential oils” on Natural Fertility Info so you can learn of them all in order to see which resonates with you and fits your needs most. There may be more than one.